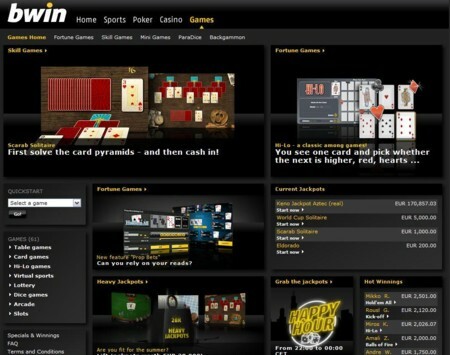 Bwin Games is owned by Bwin International Limited. Together with Bwin Casino, Bwin Sportsbook and Bwin Poker, it makes up the Bwin Brand. Bwin Games is licensed and regulated by the Government of Gibraltar and the Gibraltar Regulatory Authority and is audited by eCOGRA. Bwin International takes the safety and security of your personal and financial information seriously. They make use of a five level security system, 128-bit SSL data encryption technology and multiple firewalls. Bwin Games offers multiple games for players to choose from and some exciting promotions for players to take part in. It is available in multiple languages and runs a loyalty program with extra benefits for its members. Bwin Games is available in 22 different languages including English, German, Italian, Spanish, Swedish, French, Polish, Danish, Portuguese, Romanian and more. Bwin Games offers many different types of games for players to choose from. These include fortune games, skill games, mini games, para-dice and backgammon. Players can also choose from table games, card games, hi-lo games, virtual sports, lottery games, dice games, arcade games and slots. In total, there are 61 games for players to choose from. Some of the table and card games on offer include backgammon, mahjong, roulette, poker games, blackjack and solitaire. Bwin backgammon offers daily guaranteed tournaments and freerolls, as well as large selection of cash games. Bwin Games is offering a number of exciting promotions. The Heavy Jackpots promotion is offering six massive jackpots worth EUR 28,000 each between 2 May and 7 July, 2010. Every Tuesday, Wednesday and Thursday between 22:00 and 00:00 CET are the Happy Hour Jackpots at Skill Games. For a mere EUR 0.50 you can be in with a chance to take home big jackpots. You can take part in Turbo Risk It for great levels of excitement. Shoot to the Moons is a challenge where the highest score wins and Dice Hold’em offers more great excitement. Bwin runs the b’inside loyalty program for its players. Members of the program accumulate points for every bet that they place at the site. Once enough points have been accumulated they can be redeemed for cash or for fantastic merchandise. B’inside also offers a number of special bonuses and promotions with great prizes up for grabs. If you have any queries when playing at Bwin Games you can access the FAQ section on their website. If you do not find the answer to your questions in that section, you can contact a customer service representative. Customer service support is available every day from 8:00 to 00:00 GMT+1 for email enquiries and from Monday to Sunday 10:00 to 22:00 GMT+1 for telephone enquiries. They can also be contacted by fax. Players can make deposits in their Bwin Games account via a number of safe and convenient methods. These include VISA, Master Card, Maestro, Click2Pay, Moneybookers, NETeller, WebMoney, bank transfer and wire transfer. Players can make deposits in multiple currencies.